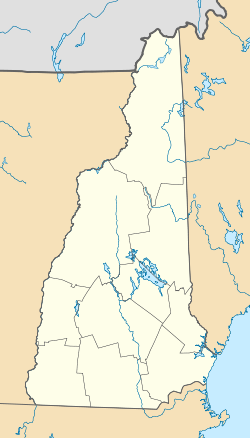 Ossipee Lake is located in Carroll County in eastern New Hampshire, in the communities of Ossipee and Freedom. At 3,257 acres (1,318 ha), it is the sixth-largest lake located entirely in New Hampshire. The lake is fed by the West Branch (entering from the north), the Bearcamp and Lovell rivers (entering from the west), and the Pine River (from the south). Water leaves the eastern end of the lake via the Ossipee River, flowing to the Saco River in Maine. The lake is classified as a cold- and warmwater fishery, with observed species including rainbow trout, lake trout, land-locked salmon, smallmouth and largemouth bass, chain pickerel, yellow perch, white perch, sunfish, and brown bullhead. ^ a b "Ossipee Lake, Ossipee, Freedom" (PDF). NH Fish & Game. Retrieved September 4, 2014. This page was last edited on 8 August 2017, at 18:50 (UTC).